The Allsup Summer Entrepreneurship Academy is a four-and-a-half day program that introduces high school students (incoming freshmen to outgoing seniors) to the entrepreneurial mindset; what it takes to start and operate a business, become a leader, and have fun while doing so. Students who join us for this one week will learn key entrepreneurship concepts, explore the possibilities of their ideas, network with leading entrepreneurs and bolster their pitching skills. Academy lessons build up to a final Idea Pitch Competition on Friday. Students pitch their business concepts to a panel of elite judges with the top ideas receiving cash prizes! Price: The cost of the Academy is $695, which includes course materials, lunches, books, miscellaneous supplies and transportation. Scholarships are available based on merit and family need. If you are registering more than 1 student, please repeat the registration process until you have registered all attendees in your party. 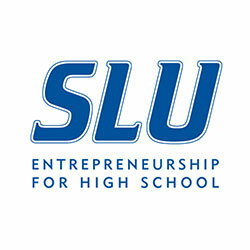 If you have questions about scholarships and the registration process please contact Jeanne Rhodes at the Chaifetz Center for Entrepreneurship, 314-977-3850 or jeanne.rhodes@slu.edu.